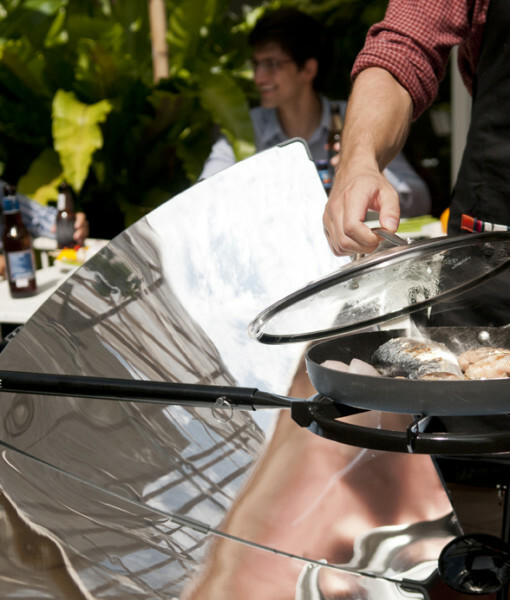 Are you interested in the SolSource Classic Parabolic Cooker? If so sign this petition to bring it back. If we receive enough interest, we will take the petition to the manufacturer. If we get the go-ahead from the manufacture, would you be willing to pre-pay for your SolSource Classic? 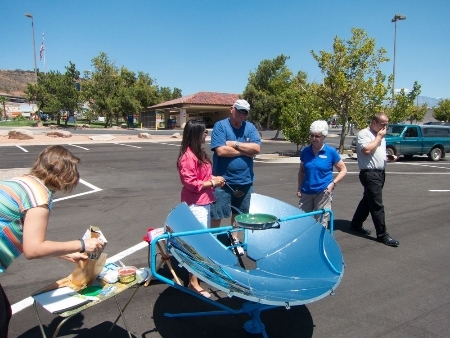 Finally a market leader for high quality parabolic solar cookers! 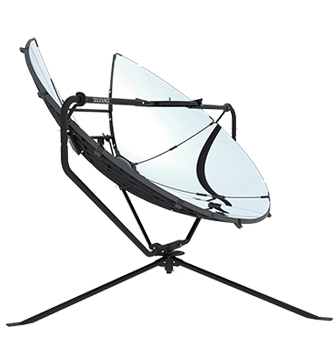 World class high quality coupled with easy mobility no maintenance have set the SolSource Parabolic Solar Cooker at the top of its class! This cooker has been tested, tried and used in real world applications in many locations around the world. From the high Himalayas to the deserts and jungles of various countries. The Solsource is the result of five years and generations of prototypes, design engineering and incorporation of the best features of the leading solar parabolic cookers from around the world. 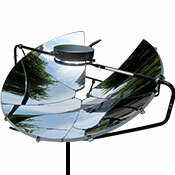 No other company has produced a comparable parabolic solar cooker that is so versatile and user friendly. It is certainly the best quality cooker on the market today. Inspired by the problem of indoor pollution from household stoves, a problem faced by many rural families in China, SolSource was developed in collaboration with Himalayan families in China. 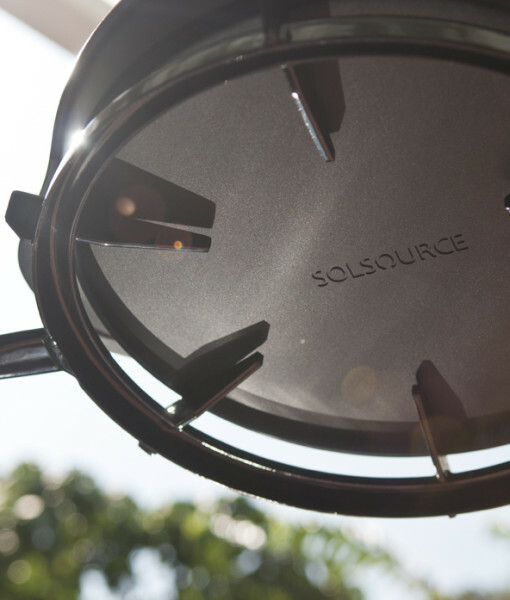 Five years and thirteen prototype generations later, SolSource is already providing hundreds of rural families with cleaner air in their homes, reducing their fuel gathering time and energy costs. On sunny days, boils 1 liter of water in 10 minutes, reaches baking temperatures within 2 minutes, grilling temperatures within five minutes and searing temperature within 10 minutes. Designed and tested out in the Himalayan mountains, it withstands even the toughest environmental conditions. Frame is made from carbon steel, and panels from outdoor endurance plastic. Pot stand/receptacle can support most kettles, pots and grill plates. Can be used to grill, steam, bake, boil or fry. Easy to clean and maintain using only some hot soapy water to take off splattered grease, spilled food and dust and dirt. It's easier to clean than your Barbecue Grill. I have found the Solsource to be very easy to assemble and disassemble due to the great design and machining involved in the manufacture of the materials and parts. You can actually assemble this cooker with no tools, that is how well the machined parts, pieces go together. 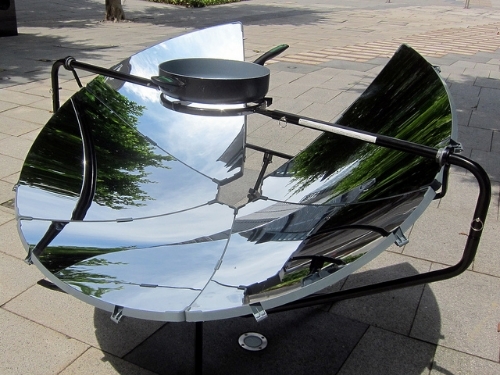 Also, even though it is not quite as compact as the French Made Cookup200, the SolSource in its disassembled state is still very compact, probably the second most compact of the commercial parabolic cookers currently available on the market. Compact enough to fit inside of a mid-to-larger size duffel type equipment bag. I even find the SolSource easier to assemble and disassemble than it is to assemble the Cookup 200, quite a bit faster by my calculations. And, the quality of the SolSource materials as well as the "fit and finish" is of a higher grade than any other parabolic currently on the market at this time. 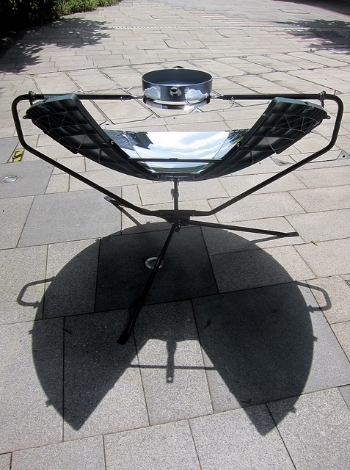 We just received our first SolSource Classic Parabolic solar cooker on September 12th 2013. This is a first run model sent to us for testing, use and review. This model is not the model that will be sold to the public, but it is very similar. The final product available to the public will have several innovative new features and enhancements that this one does not have, and it will be painted black rather than blue. ...so far I have to say that I am impressed with how easy it is to assemble. The Instructions, in a well laid out manual, were easy to follow and the parts list was complete and well identified. Parts were exact and none were missing. One person can assemble the unit, but it is best to have two people for a couple of sections that require such. Tools (screwdriver and wrench) were included and the parts went together very easily, in fact could almost be accomplished without tools due to the fine machining and fine tolerances. The quality of the materials was impressive and everything fit together nicely. All together it took me about 45 minutes to completely assemble the cooker, and I expect will take much less time in subsequent assembly/disassembly. This cooker disassembles easily enough that it is as practical and as feasible to store and transport as is the French made Cookup 200, but the SolSource is much more rigid, durable and robust. The height of this parabolic cooker is perfect for anyone to use without fear of accidents from over reaching and unstable cooking surfaces, and it is very (and I mean very) easy to adjust and to focus. Moving the unit is not too difficult once assembled, but it is best if you have help doing so since the legs of the unit can be a bit difficult to manage when they swing together and hang down when you lift the unit. This whole unit weighs about forty pounds (18 kilos) which is heavy enough for sufficient stability, yet is light enough to be able to move the cooker around as needed. The effectiveness and potency of the SolSource is very sufficient. The diameter of the parabola is large enough to create temperatures sufficient for all kinds of effective cooking. The diameter is 4 feet across (122 cm) which makes this a little bit larger than many of the small diameter (3.5 ft) parabolic models on the market. Of course the SolSource is minus one panel by design and so the overall energy generated by the SolSource is probably comparable to that of other similar sized parabolas. 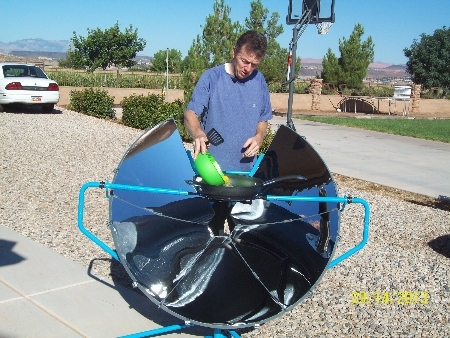 The reflective surface of the SolSource has a higher reflectance rate than do most parabolas on the market, and is in fact even more reflective than the highly polished anodized aluminum on many parabolic cookers. This makes the SolSource much more efficient than other parabolas of the same size. As I mentioned earlier, the quality of materials and the manufacturing quality are of the highest grade. The cooker is probably one of the easiest to use that you will ever encounter. It's non polluting, costs nothing extra to use it, and it will come in handy for any event, whether at home, on the road, or for emergencies. 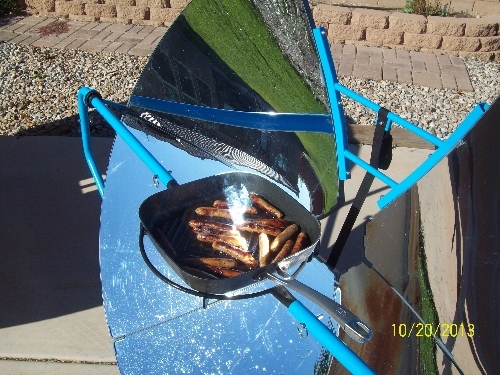 This is a parabolic cooker that we ourselves are sure to use often for many years to come and are proud to be able to have the SolSource Parabolic Solar Cooker as a part of our solar cooker family. ---Easy to adjust and focus, and there is no reaching and stretching to the pot receptacle and the cooking food. 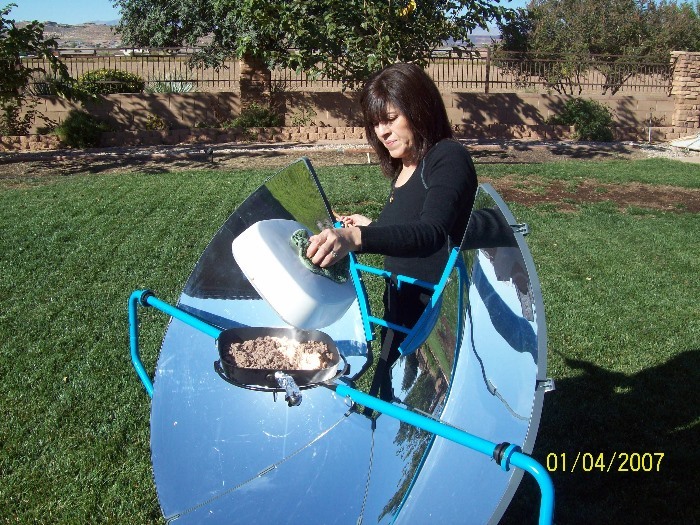 This is one of the safest parabolic cookers I have used of all of the solar cookers that my husband has at his disposal. * The materials and engineering are very good, perhaps too good--the focal point seems to be almost the size of a pencil eraser, which means the reflectors must be very precise. Plenty of energy there. * The other problem is that even with soups with lots of water, if there's any settling of the solids, that concentrated spot will scorch anything in the hot spot. The SolSource seems so small and so hot, it's almost an instant scorch spot with soups or when boiling beans or rice...It's not a real problem is risotto or other dishes that pretty much require constant stirring, but your every day soups & stews are a challenge. * The swivel setup for the SolSource is great. Although the framing feels a little wobbly on our deck I'm going to find an optimum spot to drill holes for the stakes to firm it up a bit when I use it. All in all I hope it stays in circulation, it is a great value well above average for performance. 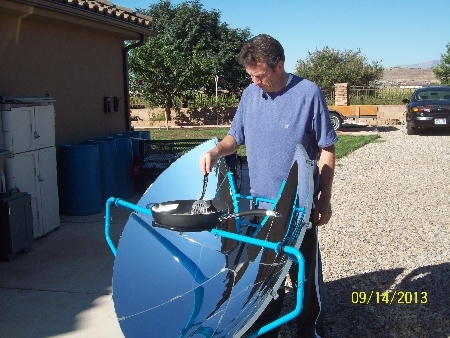 The SolSource is very easy to assemble and a well built product. The dish is made of UV protected plastic and assembled with stainless steel bolts. The frame is painted steel and the pot holding assembly is enamel coated steel to handle the high temperature. The pan sits and a comfortable height off the ground and it is usable in wind up to about 10mph. 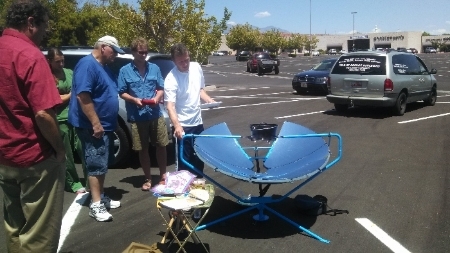 Note that this unit is a solar BBQ that has a high 1000W output and cooks food in as little as 10 minutes (as you actively stir it). 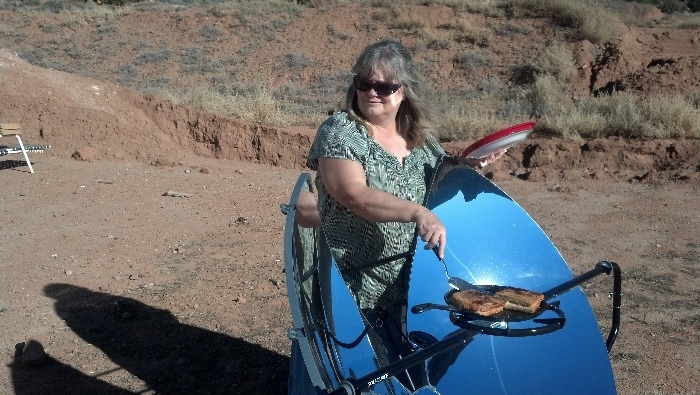 It doesn't compare to most other solar cookers on the market because they are solar ovens that slowly bring food to 300degrees over a 1 to 2 hour period (more like a crock pot). The horizontal sun alignment is very good; the vertical alignment had some issues. In the winter months I had to prop up one leg to get a low enough sun angle at my latitude this winter, but it easily had enough energy to boil water. The linkage also did not telescope well and broke in a 15mph wind. Without too much work I modified the linkage to achieve a very sturdy 70degree to -2degree vertical adjustment. I will post a YouTube video of this modification soon. The dish is a very true parabola which has its pros and cons. The pro is that it can boil a small pan of water in very low light or be used to start a fire. The con is that even a thick cast iron pan has trouble distributing the heat evenly. It will stir-fry or boil just fine, but even heat distribution is important if you want to use your solsource like a standard gas or electric range top (think omelet or pudding). I have modified my unit to be slightly out of focus to mitigate this issue. With good heat distribution it can cook anything you would cook on a 1000W electric or gas hot plate in the same amount of time. I backed SolSource through kickstarter so some of the issues I am presenting may be addressed by now (they are a great group, just contact them and ask!). 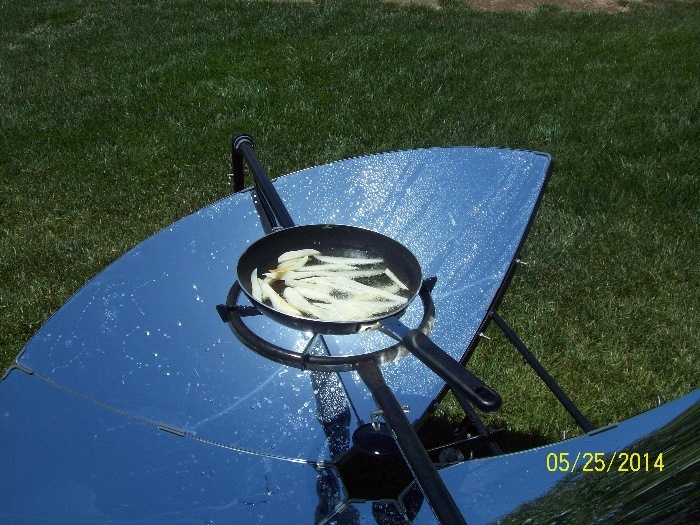 Also be aware that i am a mechanical engineer and my expectations are a bit over the top :-) Overall it is a fantastic product, and I would highly recommend it to new and experienced solar cooking enthusiasts. Sun is still beating down in PR. At least for the next month or two would be great to have these all over the island. 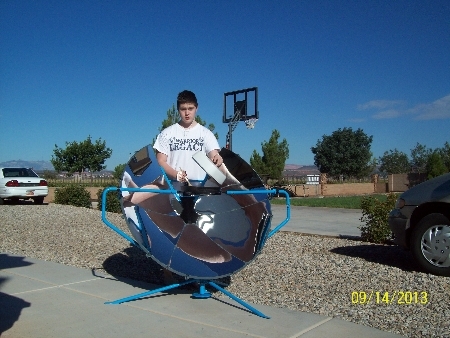 Return from SolSource parabolic solar cooker back to Homepage.